If you have window air conditioner units, either remove them and store them until next summer or cover each unit with an insulated Window Air Conditioner Cover, which can reduce drafts and heat loss while protecting your air conditioner from the elements. If you have them, remove screens and install storm windows. As you are making the swap, check for gaps or leaks around the window frames and plug areas where cold air seeps in with caulk or weatherstripping. Stop drafts and air leaks by installing window insulation kits. 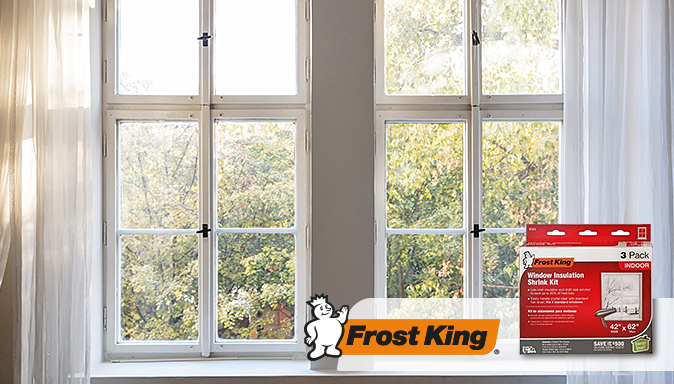 Frost King’s Indoor Shrink Window Kits feature a crystal-clear plastic sheet that shrinks tight and wrinkle free with an ordinary hand-held hairdryer. These energy-smart window insulation kits can be easily installed on metal, painted, varnished wood, or vinyl clad window frames to provide low-cost insulation that reduces heat loss by as much as 35%. Watch our video for easy installation tips.